stViewer Pro is the single Windows app for managing your email content across multiple file formats. This affordable tool is used by professionals worldwide to discover and convert email content.Email is stored in many different files. Outlook produces PST, OST and MSG files in both Ascii and Unicode format. 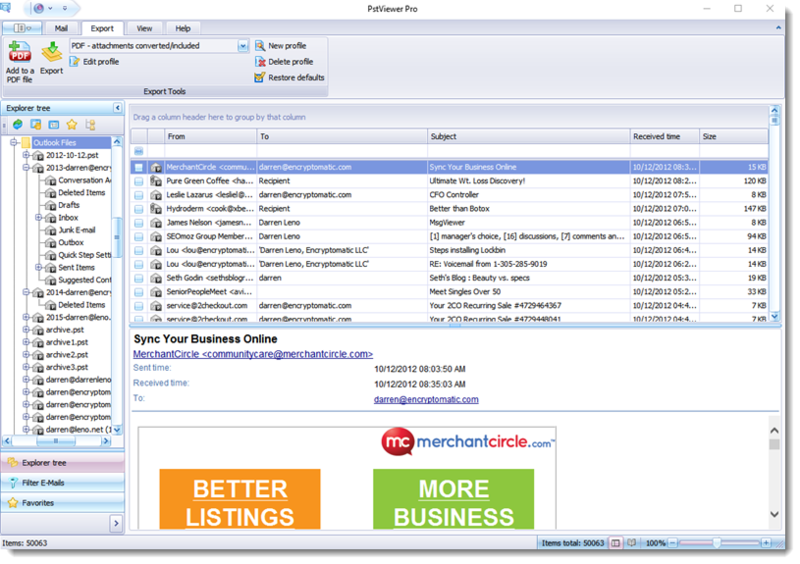 Thunderbird and other email clients produce MBOX and EML files. Emails can be stored in .MHT or Winmail.dat files. Why install multiple apps to access these emai files when PstViewer Pro can read them all?PstViewer Pro can bulk convert your emails to PDF, with options for handling email file attachments. You can extract attachments, include them as editable files within the PDF, or attempt to convert email attachments into the PDF image!PstViewer Pro also supports exporting E-Mail to Mbox, CSV (Excel), PNG, .EML, TIFF, .MSG, .ODT, .JPG, .GIF, DOCx, .ODT, and many other useful formats.Use itBulk extract E-Mail file attachments to a folder on your computer.Bulk print E-Mails to a physical or virtual printer.Bulk convert E-Mails to any of the many supported formats.PstViewer Pro has the best E-Mail rendering engine outside of Outlook, able to display complexly formatted E-Mails in html, text, and even Rich Text with Office Smart Art and drawings. Hundreds of non-standard E-mail file formats have been identified and manually coded in PstViewer Pro. That\'s why E-Mails that appear distorted in other applications are usually rendered correctly by PstViewer Pro.PstViewer Pro is owned and supported by Encryptomatic LLC, a U.S. company founded in 2005. Support is available through an online chat system, a 24 hour ticket system, email or by phone (1-651-815-4902 x2)Download a 15 day free trial of PstViewer Pro today, as more than one million other people in more than 100 countries have already done, and discover why it\'s the world\'s leading Windows Pst E-Mail viewing software.